EXETER – Exeter has known for two months that it would have a new name next to the title of superintendent and last week that name became official with a signed contract. At its Jan. 16 meeting, the Exeter Unified School District board approved a contract and officially named George Eddy as its new superintendent. Eddy, 55, replaces Tim Hire who was sworn in as Tulare County superintendent of schools Jan. 7 following the November election. Hire had served as EUSD superintendent since 2012. Eddy spent the last seven years as EUSD’s director of administrative services and the last three as director of career and technical education. He has an extensive technology background and has handled human resources for all classified employees and assisted Tim Hire with human resources and negotiations for certificated employees. Not everyone agreed with the hiring. Matt McEwen, an Exeter alumnus who has served the last nine years on the Sequoia Union School District board in Lemon Cove, asked the EUSD board to appoint an interim superintendent and do a formal, in-depth search to name a permanent superintendent this summer. McEwen said the job was only posted internally drastically reducing the number of qualified candidates for the board to consider. Eddy said the board posted the job internally and two candidates were considered for the position: himself and deputy superintendent Donya Wheeler. He said there is no rule requiring district’s do an extensive search for superintendent if they have qualified applicants. “The board felt they had qualified people within the district and didn’t need to look outside of the district,” Eddy said in an interview after the meeting. Mark Thompson, who has taught in the district for 17 years, said the board posted the job internally and did not seek any input from teachers, staff or the community on who the next superintendent should be. “This leads to a non-collaborative climate in our district,” Thompson said. The most vocal opponent of Eddy’s permanent appointment was the superintendent who brought him to the district. Renee Whitson, who served as superintendent of Exeter Public Schools from 1995 to 2012, hired Eddy in 2009 as the district’s director of technology and student achievement. Whitson said the lack of stakeholder input, the absence of a job description, and no identified criteria for the hiring process “has fostered and promoted unanswered questions, confusion, disbelief, and loss of trust in our school district for many members of our educational community and community at-large.” Whitson said her comments were not an attack on Eddy or a protest of his appointment, but a criticism of the process by which he was hired. Trustee DeWayne Faulkner asked Whitson why she had not come forward sooner in the process to voice her concerns. Whitson said she felt that her presence as a former superintendent may have been interpreted the wrong way. Faulkner then countered that Whitson was hired to take over as Exeter’s superintendent without a formal search when Mike McLaughlin resigned suddenly in 1995. 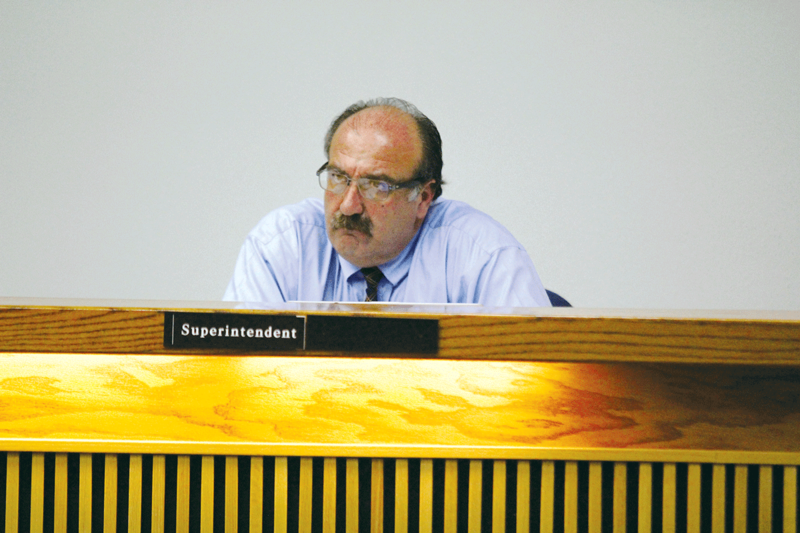 Whitson went on to say that the board could easily make Eddy the interim superintendent for the remainder of the school year and then evaluate him before giving him a permanent position. She said the six month period would allow the board the time for a full search, recruitment, application, interview and vetting as well as include community stakeholders in the process. “If George Eddy is the most qualified candidate now then he should be the right one then too,” Whitson said. Margie Reed, a counselor at Exeter Union High School, said both Wheeler and Eddy were excellent candidates who were capable of leading the district of 2,800 students and 230 employees. As the former California School Employees Association union representative for classified employees at Exeter Union High School, Reed said she has sat across the negotiating table from Eddy and Hire and said may not have always agreed but they never made promises they couldn’t keep and never broke the ones they made. “Mr. Eddy kept his word and never forgot about classified [staff],” Reed said. Reed said the trustees were elected and entrusted by parents, teachers, staff and community members to make the right choices and that everyone should respect their decision, even if they disagree with it. Retired Police Officer Randy Smith said he did a lot of work with EUSD during his 22 years with the Exeter Police Department and said the district drastically improved under the leadership of former superintendent Tim Hire and the people he put in place, including Wheeler and Eddy. “I support your decision to hire Mr. Eddy,” Smith said. Trustee Ray Strable said he did not feel the board was being secretive or rushing their decision. He said he and the other trustees only posted the job internally because they felt there were two qualified candidates already invested in the district. “We would never do anything to jeopardize your kids or ours,” said Strable, who said he has eight grandkids attending school in the district. Ultimately, the board voted 6-0 to appoint Eddy as the permanent superintendent. Mark Hellwig was absent. The two-and-a-half year contract will pay Eddy an annual salary of $180,000 including a health benefits package and a cell phone allowance of $125 per month. Eddy will be reviewed each year no later than Sept. 15. Eddy has 28 years of education experience, with most of his career in the San Joaquin Valley. He has been a classified employee, counselor, teacher, and administrator. Prior to taking a position with EUSD, Eddy worked in the district office of two other school districts, Gustine Unified and North Monterey County Unified. “When I got here I wasn’t sure if I would be staying long term but now it is home for me,” Eddy said. His longest tenure was 17 years at Turlock Unified. Eddy still lives in Turlock where he helps run a family bakery but spends his weeknights in Exeter at a hotel to avoid the daily commute. Donya Wheeler will remain as deputy superintendent. Eddy said the two have a good working relationship and the two already meet on a daily basis. “The whole district office team works well together,” Eddy said. Eddy said he will now begin the process of evaluating all facets of the district. He said he does not want to make any major moves and looks forward to leading the district.